What a busy week! Spring bustled in and, before you knew it, Winter had been washed, dried, pressed, folded neatly, and put away in the bottom drawer until November. The Lesser Celandine is now firmly established and running hard to keep ahead of the Dandelions who are power-walking along the verge of every road. Lambs are now so common as to be hardly worth a photograph and as for the Rabbits, well, they are just everywhere. Snowdrops are just a memory, with the occasional green seed bell still dangling there, forlornly wondering if it was worth hanging on to the end. There are Daffodils around in plenty, but even they are beginning to consider that they may have overstayed their welcome, and are starting to stand up, look for their coats and mention that they really should be going . . . The Honesty is in flower and the dark purple leaf spikes that herald the arrival of the Rosebay Willowherb have turned green, seemingly overnight. The sheen of Silverweed feathers sprinkle the roadside where the grass is short and the Lungwort flower spikes with their mixture of tiny red and blue trumpets are taking over the shaded spaces. 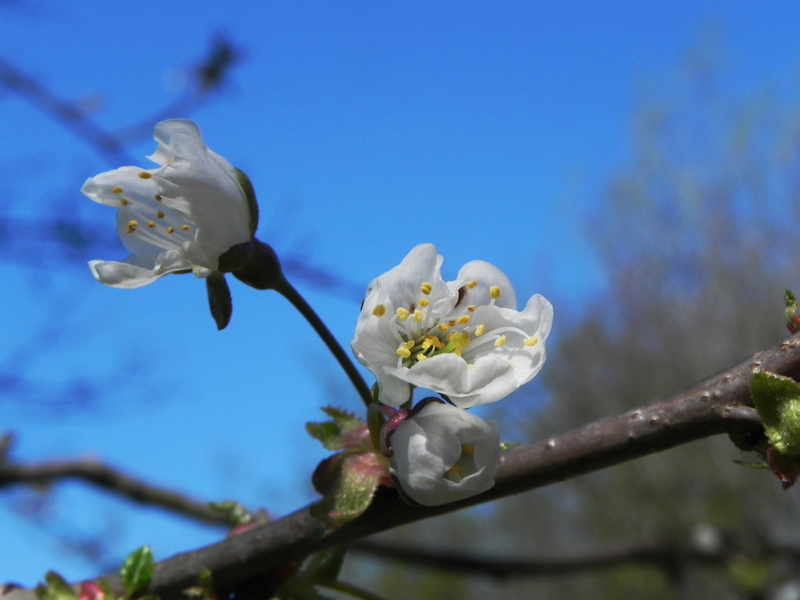 And here we have Cherry Blossom – it reminded us that in the Autumn we gathered a little jar full of cherries from these very trees – we covered them with sugar and brandy and put them in a dark cupboard. We wondered how our little jar was getting on – perhaps we ought to check. Often, when we go down to the bridge over the beck, just as we get there, a small, brown bird will fly off. We’ve tried sneaking up and peeping over the railings, but he is a sort of slate grey and he likes the muddy spots just under the bridge, so we normally don’t see him until he flies away even on those days we do find him in residence. When he takes wing he leaves behind a fleeting glimpse, a flash, of a yellow rump. That he’s a wagtail of some sort there is no doubt, he has quite a long tail and flicks it disdainfully as he prepares for take off. Well, you know how it is, if people get up and leave every time you join the party, you begin to worry if you’ve upset them in some way. Today, for the first time in nearly three years, he stopped to chat – and he sat still long enough for us to get a picture of him. He still wasn’t over the moon to see us, peeping out at us from behind some twigs, which the camera, obligingly, focused on, but we were, never the less, very pleased to have advanced our relationship to this level. 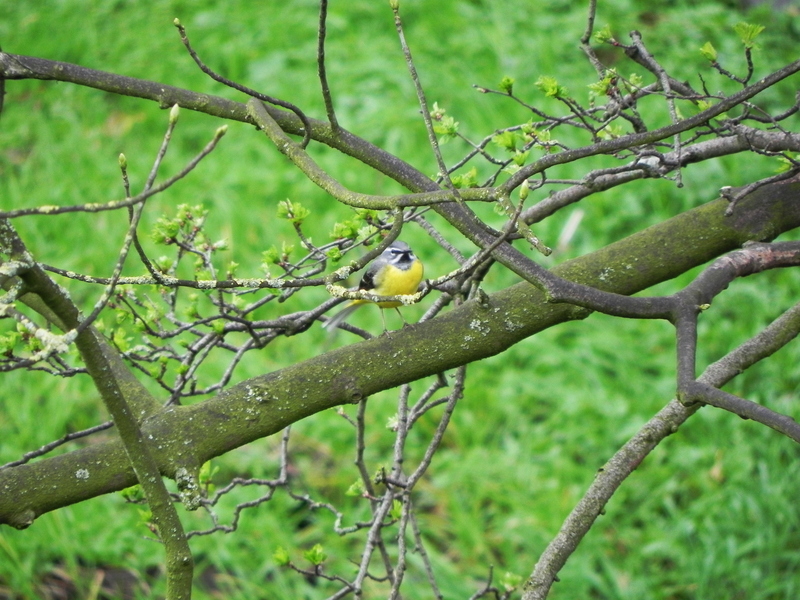 We are reasonably confident that he is a Grey Wagtail – I know, I know, but I’m not in charge of bird names – he likes marshy places best, but is happy to visit the towns and cities of the south during winter so he may just be a summer visitor – we’re starting to see a lot of those. Time is funny stuff. It’s easy to convince yourself that it doesn’t exist and we just made it up. Just look at what we do with it. We shuffle months round depending on the emperors available – adding days in here and taking them from there. Interestingly the winter months (in the northern hemisphere) hardly ever have an emperor’s name. It seems that emperors mostly go for summer months. I presume it’s a politically motivated choice. If you want to be popular you need to donate a public holiday to the masses. A summer month is the best choice here as, not only does it gives the plebes a nice day out but all the mercatores will be out in the market places with their stalls. Add a couple of extra days to the month so that the holiday doesn’t reduce the number of working days and you will get the negotiatores vote as well. Win, win, really. When Pope Gregory decided to pinch 11 days out of our lives you’d think that would be the end, but no. To this very day we continue to fiddle with time, add an hour here, take away an hour there. 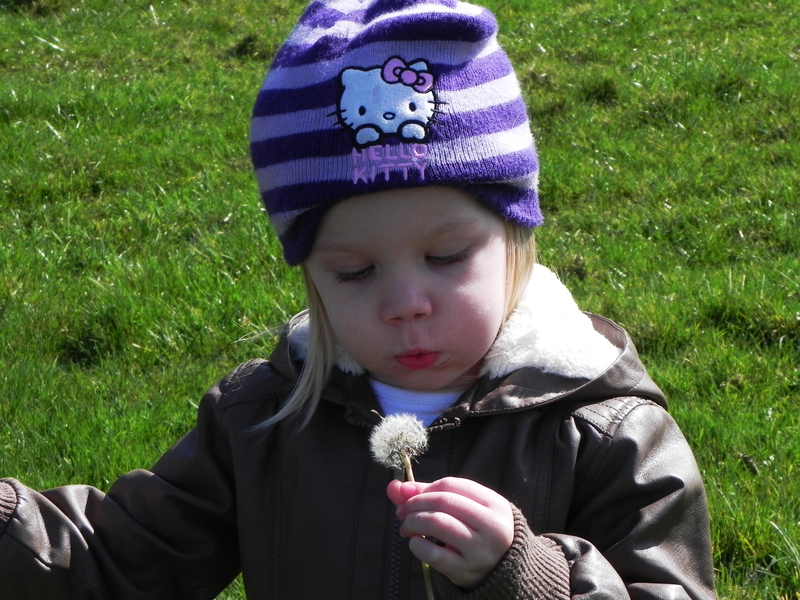 Which brings me to the point of all this discussion – what time is it when you blow on the Dandelion and the seeds don’t fly away? This last week has been horrendous weather-wise. Almost all day every day there has been a hard, cutting wind growling and stamping around in the woods behind our house, bashing the dustbins about and spreading their contents up the lane. Then, for the edification all the new born lambs in the fields around, we’ve had a sample of every type of precipitation available from the current catalogue. Rain, hail, snow, one after the other with hardly a half an hour break between them. At the same time, there was also a shortage of clouds. I’m not sure exactly why, but my guess is that the wind was blowing so strongly that there wasn’t time to get them out of their boxes, unwrapped, fluffed up and on the conveyor belt, to be able to fulfil the delivery quota. The end result was a very uneven cloud cover – and sometimes as much as ten minutes of sunshine, suddenly and for no apparent reason, between the deluge, the hail and/or the snow. And today? For most of the day it has been warm and sunny. We went out for a drive, zipped our coats right up and opened the sun roof to let the sunshine in. It was almost Spring-like. Oh yes. the picture. 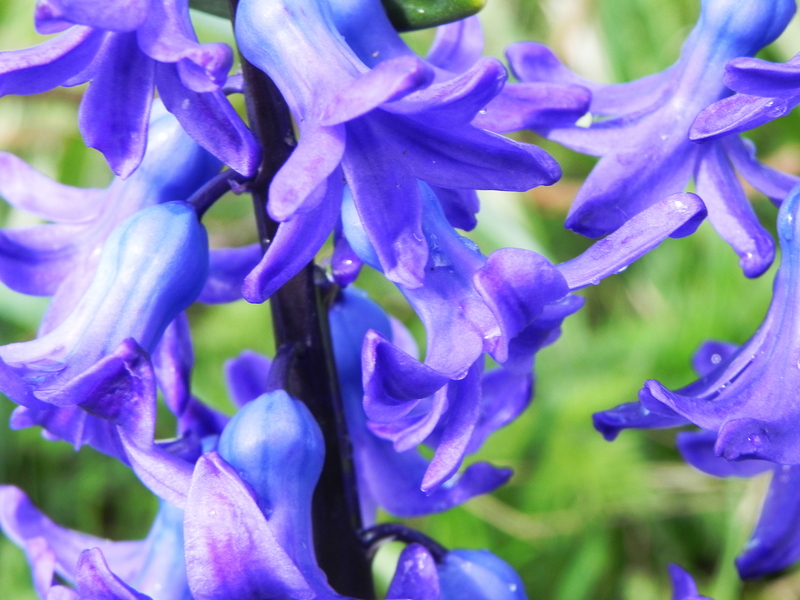 It’s a Hyacinth – I mentioned the carry on between him and Apollo once before – have a look here. I thought you’d seen enough lambs for the minute.